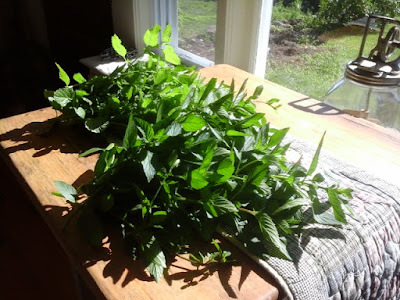 Its the season for preserving the bounty that the garden is producing. A. To have the highest quality, most nutrient dense, pesticide free, food possible. B. To avoid being totally reliant on somebody else, somewhere, to provide our most basic necessity. I mean, really, when you think about it, do you really trust that unnamed "they" to always, without interruption, be able to deliver food to your local market whenever you need it? Really? Cooperation is understanding, and applying, methods which encourage the growth of bacteria and fungi necessary for soil health, and mineral balance. It invites beneficial insects to control the not so beneficial ones. It welcomes pollinators, and earthworms. Dominance is importing chemicals in the form of fertilizers, pesticides, or herbicides, to artificially force the intended crop to grow, while restricting all other growth, good or bad, helpful or harmful. Here are pictured several key methods of food preservation. 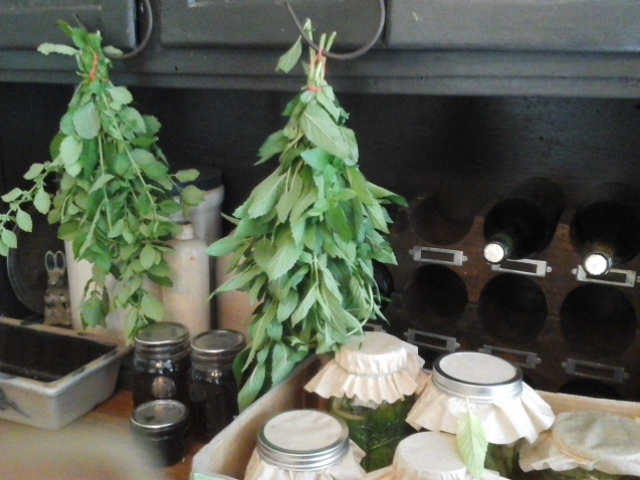 Herbs are hung up for drying. Some small jars of our maple syrup illustrate preserving in sealed jars ("canning") , and both the bottles of homemade wine and the jars of various pickles illustrate how fermentation by natural action of yeasts (wine) and bacteria (pickles) help preserve food. If we cooperate with the natural systems that the Creator designed, food will just grow. And grow bigger, tastier, and more nutrient dense. So, if we are trying to grow food in cooperation with these systems, maybe we should begin to think about preserving it in the same way. Doing this will retain the "life"of the food, all the enzymes and nutrition wont be cooked out and poured down the drain. Before the advent of cheap energy and thus refrigeration, all societies found ways to preserve food. They relied on natural methods like smoking, dehydrating, salt curing, and fermentation. And these self same methods work today, both retaining, and in some cases, enhancing, the goodness of the food. So I have categorized common methods of food preservation as to where they fall on the scale between dominance, and cooperation. Dominance, in this case, would be beating the food into submission and just daring it to rot. Of course that means using methods that kill all life. Cooperation would be trying to keep or enhance the life that is already in the food. Interestingly, the closer a method comes to total cooperation with natural systems, the nutrient density stays high, and the energy requirements go down. Funny how that is. Celery leaves drying in a sunny window. They will later be packed into jars for seasoning soups and stews. Homegrown celery is so much more flavorful than storebought, that even the leaves are worth saving for later! 5. CANNING. Lowest on my list, meaning it leans the furthest toward dominance, is canning. Yes, I used to can everything. And I still do for certain things. But the process of canning requires a big energy investment in terms of bolilng water and using a pressure canner or water bath canner. IT ALSO COOKS PRETTY MUCH ALL THE LIFE OUT OF THE FOOD. The reason canning preserves food is that the high temperatures kill all the bacteria, the nasties like clostridium botulinum(causes botulism) and the good bacteria and yeast which act as probiotics in our own systems. Its like taking an antibiotic - anti (against) biotic (life). This method indiscriminately destroys all life. It has its uses, but it still my least desirable method. 4. FREEZING. Freezing retains many more of the nutrients in the food, although some are lost when the food is initially blanched or steamed. Lots of enzymes are lost in that process. Freezing also requires a big energy investment. Do you like paying all those electric bills? Me neither. And unless you have a vacuum sealer (another expense and energy hog) frozen food isnt all that great after a few months. 3. SMOKING, SALT CURING. These are methods usually applied to meats. Since we dont eat meat, I wont go into detail other than to say this has a generally lower energy requirement, and doesnt cook the heck out of the food. Jerky, wood smoked salmon, corned beef, bacon... these are examples of this method of preservatiom. 2. DEHYDRATING . Now we are further on the scale towards cooperation. Dehydrating retains most of the enzymes and nutrients in the food. Basically, the food is still raw, and only the water has been removed. Dehydrating can vary, however, in its energy requirement, Using a dehydrator can be an energy hog. Or, a solar dehydrator can be built (some energy investment) which uses the sun's power to do the job. Or it can be as simple as hañging herbs up to air dry. (No energy required). Once dry, the food will last a very long time. 1. FERMENTATION. Now we are completely at the other end of the cooperation spectrum. Fermentation is the art of using the naturally occuring bacteria or yeast to act upon the food and preserve it. A yeast fermentation creates wine, beer, or any alcohol. Bacterial fermentation creates things like kimchi, sauerkraut, pickles, yoghurt, cheese. Fungal fermentation beside yeast creates tempeh, natto, miso. Combinations of both yeast and bacteria create kefir, kombucha, and apple cider vinegar. These foods preserved this way are very much alive. The beneficial microorganisms are healthy for us, nutritious, and, most often, delicious too. Additionally, energy requirements are low or zero. While some ferments requires a warm temperature to be maintained (could be as simple as a cooler with a hot water bottle) most dont need anything other than a spot on your countertop or in a dark cupboard. So, when I think now about preserving food, I first see if I can use a cooperative method, like fermentation or dehydrating. For example, i am making all, or at least most, of our pickles this year using fermentation, rather that vinegar pickling. 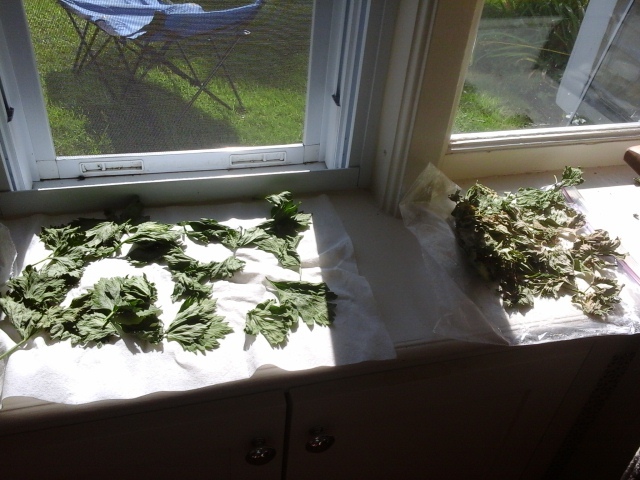 I will dry herbs, fruit like apples and tomatoes, zucchini,peppers, kale, possibly onions and garlic if needed. Dehydrated mushrooms are fantastic to have handy for any recipe. I am fermenting apple cider vinegar and I make yogurt every week. I have a batch of kombucha going. Sauerkraut and kimchi will come when we harvest the cabbages. I WILL use canning for some things, mainly applesauce, possibly some convenience foods like veggie soup, green beans, and the jams and fruit spreads. I will freeze a little, but, we dont have a separate freezer, so space is limited. Probably just as well. So there you have it. My shelves are still lined with canning jars (most of which I am too lazy to label, because, hey, you can see whats in it, but which for some reason Steve can never seem to figure out. "What is this?" ) For the most part, however, they are full of dried veggies and fruit. Or some fermenting pickles. Yum.